The chickens will have to wait just a little bit longer as the City Council of Iowa City has delayed the final decision on allowing backyard chickens within the city limit. The city council has taken some steps toward making a final decision and setting up regulations for Iowa City to allow backyard chickens to be kept. Two votes were finalized, but the third that was up for discussion was postponed until the next meeting time. The vote was approved for a zoning change to allow for chickens, and the first vote on the permit process was taken as well. The second portion of the permit process voting was not completed, though, and was left for the next meeting because they remain divided on the issue of obtaining permission from neighbors in order to have backyard chickens. 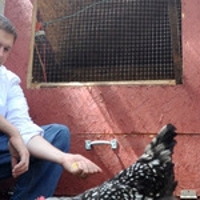 The issue began to be discussed recently as a result of many people petitioning for the city to allow backyard chickens. The City Council finally began to address the topic and began to create legislation that will allow people to have the chickens. Topics already discussed include chicken coops and buildings to be allowed for them as well as the limit of hens and roosters allowed in a yard. The City Council has made great strides and will continue to complete the legislation. The City Council meets every two weeks in Iowa City and will continue the voting next time in hopes of reaching an agreement on the issue of getting neighbors' permission to have chickens.